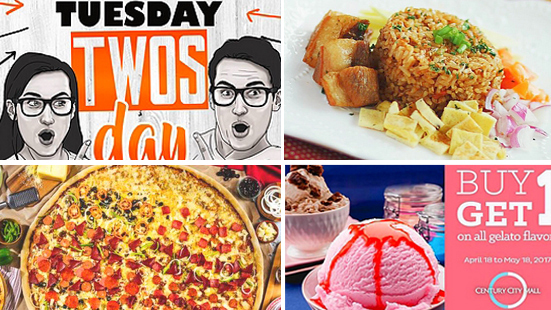 Beat the heat with these cool promos. (SPOT.ph) We know what you're thinking: How can payday be so near, yet still so far? The good thing is that we found food discounts and promos that won't hurt your wallet. 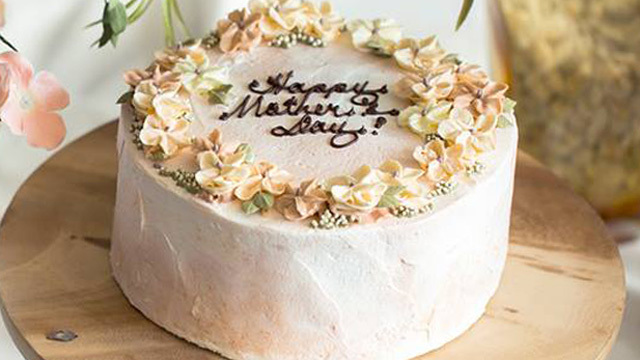 We've got restaurant deals on your favorite dishes, two-for-one-gelato, a Mother's Day treat, and more. Cool down this summer with your BFF at Mio Gelati! Buy one scoop and get another to celebrate the opening of their new branch at Century City. Promo is exclusive to this branch until May 18. 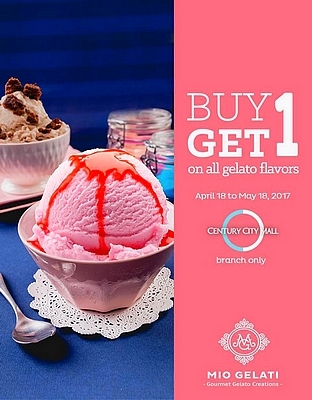 Mio Gelati is at LG/F Century City Mall, Kalayaan Avenue corner Salamanca Street, Poblacion, Makati City. For more information, log on to Mio Gelati’s Facebook page. 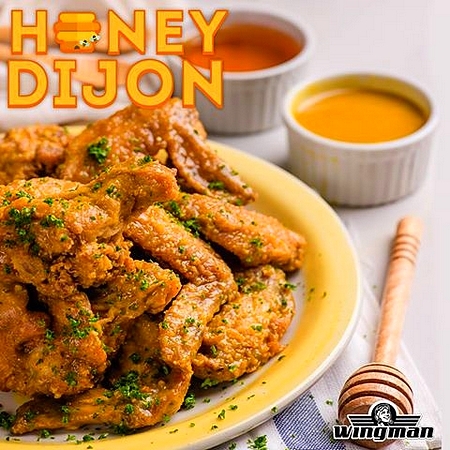 Rich honey and tangy Dijon mustard make for an instant classic in Wingman’s Wing of the Month! Get a free drink whenever you include Honey Dijon in your order of one dozen of wings. Wingman is at The Collective, 7274 Malugay Street, San Antonio, Makati City; and LG/F Casa Real, Acacia Estates Town Center, Acacia Avenue, Taguig City. For more information, log on to Wingman’s Facebook page. 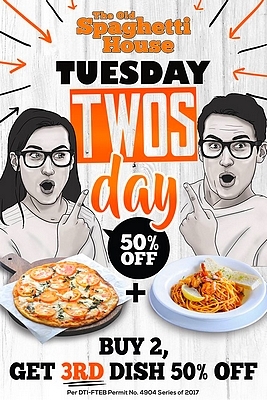 Tuesdays just got tastier at The Old Spaghetti House! Order two meals (pasta, pasta meal, pizza, or rice meal) and get your third meal at half the price. Promo is valid on dine-in transactions until June 27. Keep your heads up and your eyes on the sides! 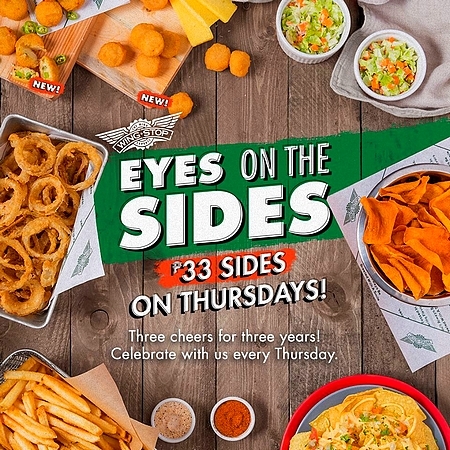 Celebrate three years of Wingstop with a special treat every Thursday: Delicious sides for just P33! Promo runs until July 20. See a list of Wingstop branches. For more information, log on to Wingstop’s Facebook page. Your favorite taho in gelato form is on a discount! 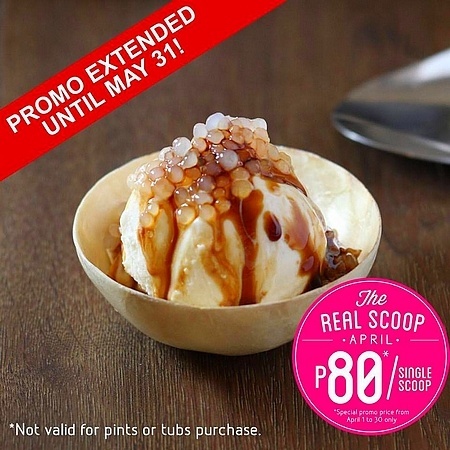 Beat the heat with this sweet treat for just P80 per scoop until May 31 at BONO Gelato. Celebrate Mother's Day at Applebee's! Moms Eat Free until May 21 with a minimum single receipt dine-in purchase of P2,500. Your mom's free meal will be a choice from Applebee’s Lunch Combo 1, 2, 3 or 4. Applebee’s is at G/F W Global Center, 9th Avenue, Bonifacio Global City; and Cybermall, 10 Eastwood Avenue, Bagumbayan, Quezon City. For more information, log on to Applebee’s Facebook page. 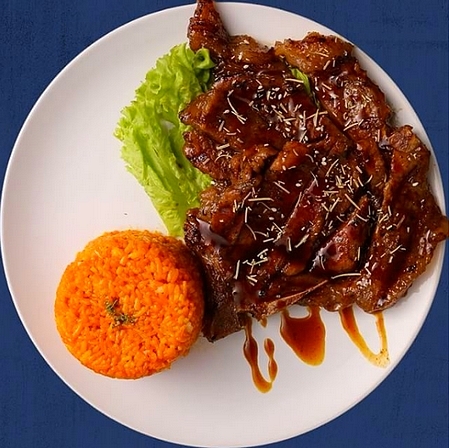 Lunch is on a discount at Vanilla Café, priced at P198. 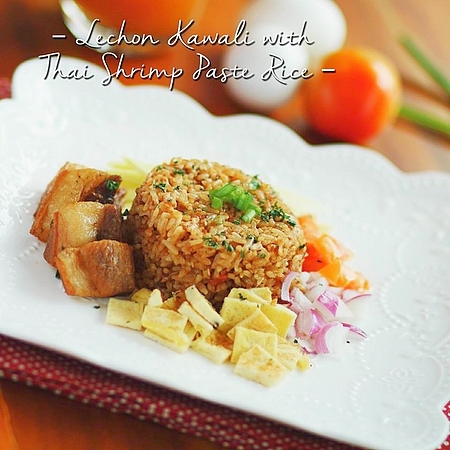 Take your pick from Beef with Broccoli, Chicken Teriyaki, Fish Fillet in Curry Sauce, and Lechon Kawali with Thai Shrimp Paste Rice. Craving barbecue? Head over to Blake’s Wings and Steaks, and enjoy a 10% discount on the Grilled Salmon Steak for all weekdays until May 12. Blake's Wings and Steaks is at 75 Mayor Gil Fernando Avenue, San Roque, Marikina City; and 186 Katipunan Avenue, Project 4, Quezon City. For more information, log on to Blake’s Wings and Steaks’ Facebook page. Enjoy Braska’s latest addition to its menu! 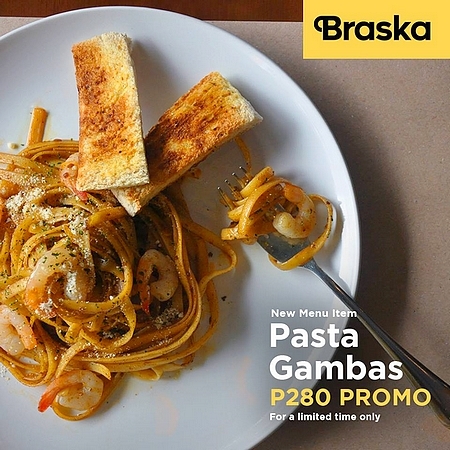 Have a taste of the Pasta Gambas at a discounted price of P280. 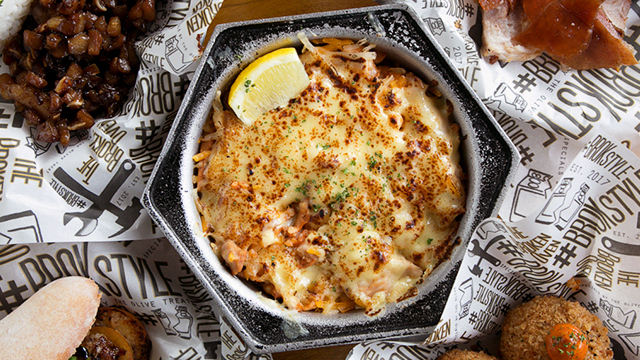 Indulge in fettucine and shrimp, smothered in spicy, garlic-flavored home-style gambas sauce. Braska is at 1669 Bocobo Street, Manila. For more information, log on to Braska’s Facebook page. BIG Guys Pizza’s birthday promo is back for the month of May, which means 10% off on any pizza flavor or size. Just present your ID to avail the discount. 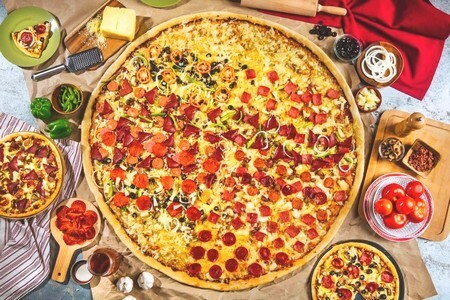 See a list of BIG Guys Pizza branches. For more information, log on to BIG Guys Pizza’s Facebook page.